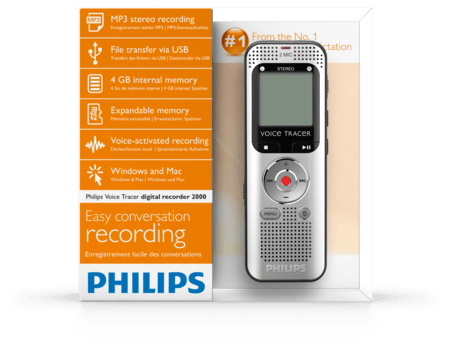 The VoiceTracer 2000 is the perfect voice recorder for capturing conversations while you are on the go. Thanks to MP3 stereo recording you get always great audio quality which you can easily share with others. The large graphical display lets you view all important file information at a glance, even in poor lighting conditions, thanks to the backlit display. The batteries of the new recorder last for up to 42 hours for extra long recording sessions. Enjoy your favourite FM radio programmes whenever you like, as often as you like. Simply activate the record function when you hear your favourite radio programmes and the VoiceTracer records the radio signal in MP3 format.